Staring straight into the face of our show week for JuMP 2016, I’m happy to take a moment to organize my thoughts, ground myself, and reflect on the unique experience of being the 2016 JuMP Choreographer. FACT/SF’s JuMP Program has opened up so many doors for me. It has allowed me to better hone my artistic voice and my choreographic skills, and welcomed me into a new community of dancers and creators who similarly held high-respect for their art and craft. JuMP has also showed me the value of sharing work in early stages, gaining new perspectives, and eventually solidifying my own choices. The Bay Area has provided me with a variety of wonderful opportunities to present my work as an emerging choreographer. I could not be more thankful for the directors, festival curators, and dance peers who have taken a risk, extended their hand, and invited me to present my art. These past experiences have not only prepared me to advance as a choreographer, but also significantly increased my desire for achieving even more. 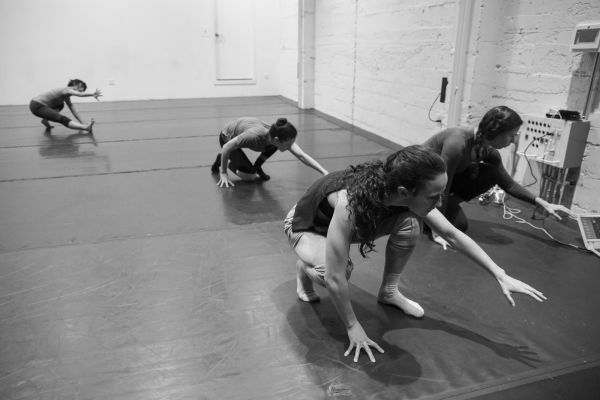 By sharing their incredibly talented, diverse, and intelligent dancers, organizing rehearsal times and spaces, providing budgets for lighting designers, costumes and marketing, and financially compensating all those involved, FACT/SF gave me the chance to take a giant leap: creating my first evening-length work . JuMP offers an environment choreographers often only dream of, where they can step into a role of pure creation and creativity without being weighed down by questions of time, money, scheduling, etc. In my heart, I knew I was artistically ready for this challenge. Realistically, I didn’t believe it would happen so soon. Though the opportunity to let go of the “business” side of our industry lifted a huge weight, I quickly found that it was replaced by a serious sense of duty, devotion, commitment, and passion. In wanting to make the most of this rare chance for pure artistic discovery, everything deserved consideration: sound, lighting, costumes, makeup, projection, set design, movement strategies, structure, scale, use of the theater, etc. In order to embrace the freedom of choice, I first had to overcome the sense of being paralyzed by all of the potential. So I strategized with myself from the beginning – take the first few weeks to just play, discover new ways of approaching movement and sculpting the space, be specific to this experience, to these dancers, to this theater, and absorb all of the knowledge, advice, and collaborative spirit that this program holds. I was guided by my will to let go, listen, reflect, and experience. It opened up a whole new space in my mind. I welcomed the dancers’ refreshing and inquisitive thoughts about the piece, the theater, and their physicality. This, along with JuMP’s work-in-progress showings, left a really strong impression on me. Never before had I had the time or desire to present work to the open public for feedback before it was “complete”. I have to say, hopefully without sounding too dramatic, it terrified me. But ultimately, the work-in-progress showings helped me understand that I can simultaneously hold others’ thoughts and opinions in my mind while also sifting out what is most important to my work and me. I can share people’s opinions and let others go. I can hear their criticism and appreciate it for the fact that my work has connected to them and sparked a dialogue. I found myself inviting people with an open-mind, willing and happy to hear their ideas even though we still had more to work to do on the piece. All of that feels really exciting – to be able to balance the input of others while staying true to yourself. It marks significant growth and progress for me, and is surely something I will hold onto even after this work is complete. Looking forward to our final rehearsals together, I’m filled once more with a flurry of emotions. But the one feeling that seems to be rising to the top is a sense of gratitude and appreciation. I am grateful that I had the opportunity to become part of the FACT/SF family and join a short history of really inspiring commissioned choreographers. I am grateful to be reminded of the incredible social and dance community that I have been surrounded by since moving to the Bay Area almost 6 years ago and very much look forward to sharing this work with them. I am also very grateful to have my family here from the east coast to experience this world we live in and the work to which we have been committing ourselves. I see this work not only as a culmination of almost 3 months of intense exploration and development, but also as a reflection of my own personal growth. Speck contains a part of myself, and I hope that audience members see a small part of themselves in it as well. Together, we’ll explore the topic of space exploration, human ingenuity, bravery, diversity and perspective. Somewhere in those ideas there are things we can all own. And that is why I love creating dance.